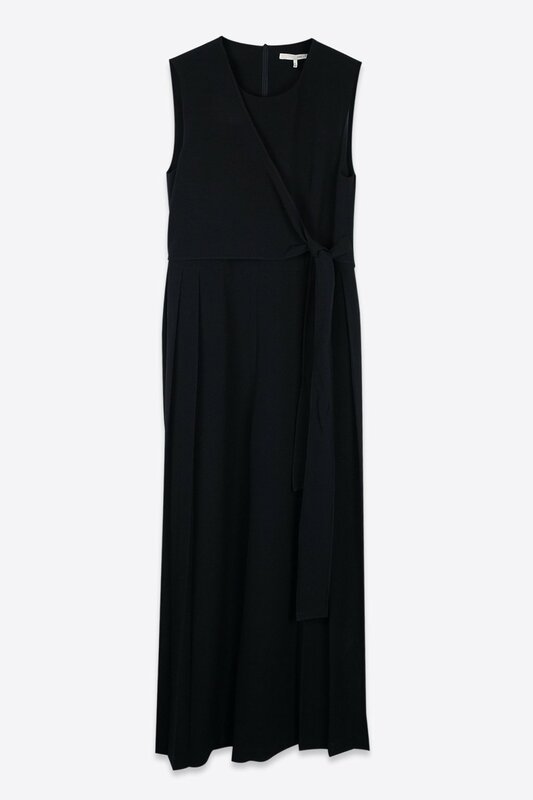 An elegant piece crafted perfectly for the spring season, this comfortable jumpsuit is bold enough to be worn on its own. It features invisible back zip closure, overlay front with tie, elongated back darts, inseam pockets, and wide legs with unique side accordion pleats. Softly accessorize with dainty jewelry and your favourite pair of mules. Fabric Content: 64% Polyester, 34% Rayon, 2% Spandex Care Instructions: Machine wash cold, tumble dry low, or lay flat to dry. Cool iron. Fit: Relaxed Approximate Measurements: XS: 29” bust x 23” inseam S: 31” bust x 23” inseam M: 33” bust x 23.5” inseam L: 35” bust x 23.5” inseam Model wears a size small. Model's height is 5'9".